Escape to beautiful Sunny Saltair Seaview cottage in Cowichan Valley on Vancouver Island BC, Canada. The vacation rental offers an experience from relaxation on the deck to hiking,biking fishing for crab and prawns that every guest will want to return and let others know. The cottage is equipped with new stainless steel appliances, new queen bed and new queen size pull out sofa with all new linens. 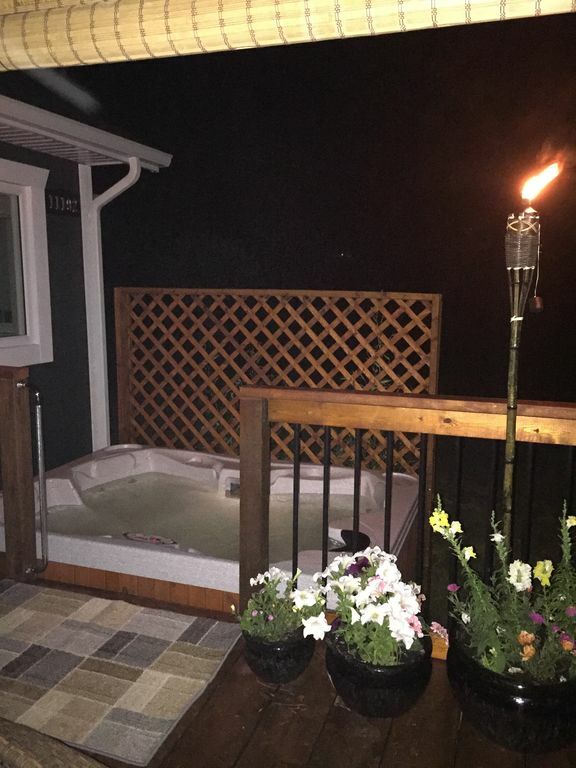 The cottage is surrounded with a breath taking oceanview from the lovely front deck with its cozy sitting area with bamboo and a water fountain. The cottage is fully equipped with everything you would require as if your at home away from home. Located in Sunny Saltair 5 minutes from Chemainus with its world renowned famous Murals. We are located only 15 minutes from the Nanaimo Cassidy Airport , 20 minutes from Duncan and 25 minutes from the BC ferry terminals. Cowichan Valley boasts beautiful scenery with its local wineries, farmers markets and local eateries. The cottage includes a projection TV with Netflix, WIFI, hot tub, BBQ, bicycles and brand new kayaks for a minimal daily cost inquire with owner. Boating/fishing excursions is available. Massage services is offered by The Cedars Escape and Spa. The cottage is close to local lakes, rivers, walking and biking trails. Enjoy sipping on one of the local vineyards award winning wines while taking in the panoramic ocean and mountain views. The Sunny Saltair Seaview cottage experience will leave you with many memorable memories. I enjoy the outdoors and enjoy making my vacation rental home the best it can be so guests can thoroughly enjoy their stay. I enjoy gardening and boating. Location Location Location You have your own cottage for your stay Serene views and a cozy atmosphere close to many attractions and our renowned famous Chemainus Murals. Beautiful scenic ocean and mountain views from all areas of the cottage. Your experience will Includes kayaks, and bicycles which are complimentary for stays longer then 4 nights.. Hot tub overlooking the beautiful ocean in Sunny Saltair near Chemainus BC on Vancouver Island. Chemainus offers lovely restaurants and a theatre Excellent hiking trails near by as well you are walking distance to the beach. Projection Apple TV with Bluetooth soundbar and subwoofer capable of playing tunes from your phone. Two balconys one looking out to ocean with hot tub and out door furnature . The other with covered outdoor dining table for four and full size BBQ. Two decks one looking out to the ocean with hot tub and covered gazebo with padded outdoor furniture. The other with full size BBQ and outdoor dining table for four people. Nice little house that had everything we needed. Loved the bright sunshine in the unit, the comfy sofa, Apple TV and hot tub. Very private. Walk is not easy or comfortable along road to beach but that is the only slight negative, and owners have no control over that matter. Would love to stay again some time. Thank you kind hosts! It was a pleasure to have you both stay at the Sunny Saltair Seaview Cottage. Every year seems to be getting busier on Vancouver Island and yes the traffic is everywhere as we are in the middle of tourism season. I have lived on the island for over 40 years and have seen an increase of population. I don’t offer any consumables because of the health and safety standards so that is why I supply the basics. I do however sometimes supply crab which I catch out in the front of my property as well as herbs from the garden. There are two vegetable gardens when in season on the property which I usually offer to the guests as well. The Sunny Saltair Seaview Cottage is fully booked throughout the season because of what we have to offer. Hot tub, full kitchen, dining room, outdoor dining area, access to fishing, crabbing, bikes, kayaks and more. I did offer the kayaks at no cost as I could tell you were on a budget and I really hope you both enjoyed them. I hope your experience elsewhere will be within your budget. My husband and I and our 6 year old daughter stayed at Dean and Tracy's and were very satisfied. As shown in pictures, great ocean view from kitchen, living room and deck and we loved the hot tub. Clean, great location - grocery store a few minutes away along with restaurants, parks, ocean, etc. Mellow home base with easy access to all the neighboring towns, ferries, airport, etc. Dean was very helpful and available. We will definitely be back and hope to make it out on a boat trip with Dean and Tracy next round! It was so nice clean comfortable and hot tub was fabulous! Owner Dean and partner Tracey are so friendly and helpful!Hope we can return one day. Such a lovely little place!